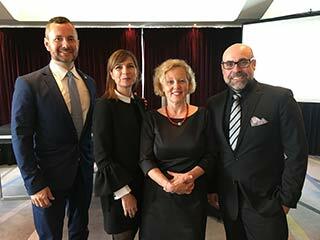 (L-R) Ernst Holzer and Belina Neumann, Vienna International Airport; Elke Bachner, Vienna Tourist Board; and Armando Mendonca from AMPM. 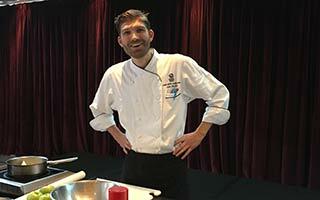 The Ritz-Carlton Toronto’s pastry chef, Gael Moutet, demonstrates how to make apple strudel. Representatives from the Lufthansa Group (Austrian Airlines), Vienna International Airport, and the Vienna Tourist Board. 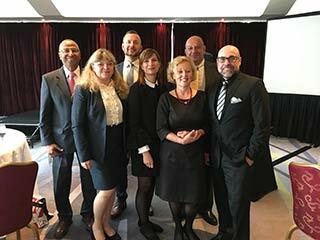 It was an afternoon spent in high style with the Vienna Tourist Board hosting industry partners and media to high tea at Toronto’s Ritz-Carlton. 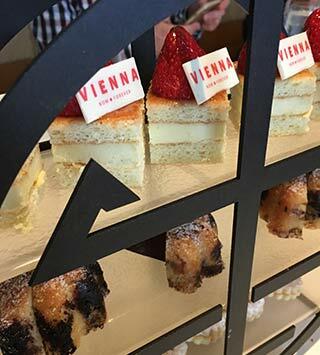 Joined by Austrian Airlines and the Vienna International Airport, attendees were treated to Viennese treats compliments of the hotel’s own pastry chef, Gael Moutet, known for his tenure at Laurent, the two Michelin-starred restaurant in Paris. 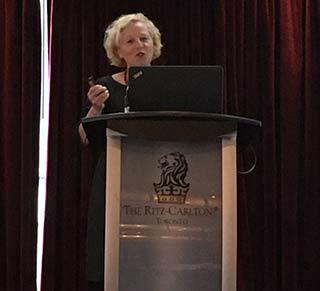 Offering a glimpse of what a weekend in Vienna could look like, Elke Bachner, market manager Canada for the Vienna Tourist Board, highlighted the city’s many shopping and dining opportunities, along with its museums, architectural gems, activities and lively wine scene. Peter Daniel, senior product and program manager for Lufthansa Group in Canada, spoke to Austrian Airlines 60th anniversary this year, commenting on how the airline has grown since it began with one route – Vienna to London – in 1958, and now has 85 aircraft that fly to 130+ destinations in 55 countries, and in 2017 transported 13 million passengers on its network. 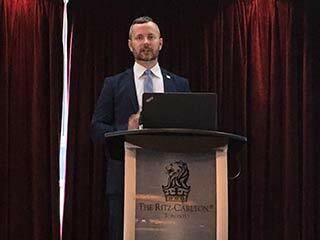 In fact, last year was a record year for the Vienna airport, reporting 24 million passengers, which – in a Canadian context – is a similar size to YVR. Serviced by over 70 airlines and offering almost 200 destinations that can be reached non-stop out of Vienna, out of Toronto alone, the airport receives up to six flights per week.